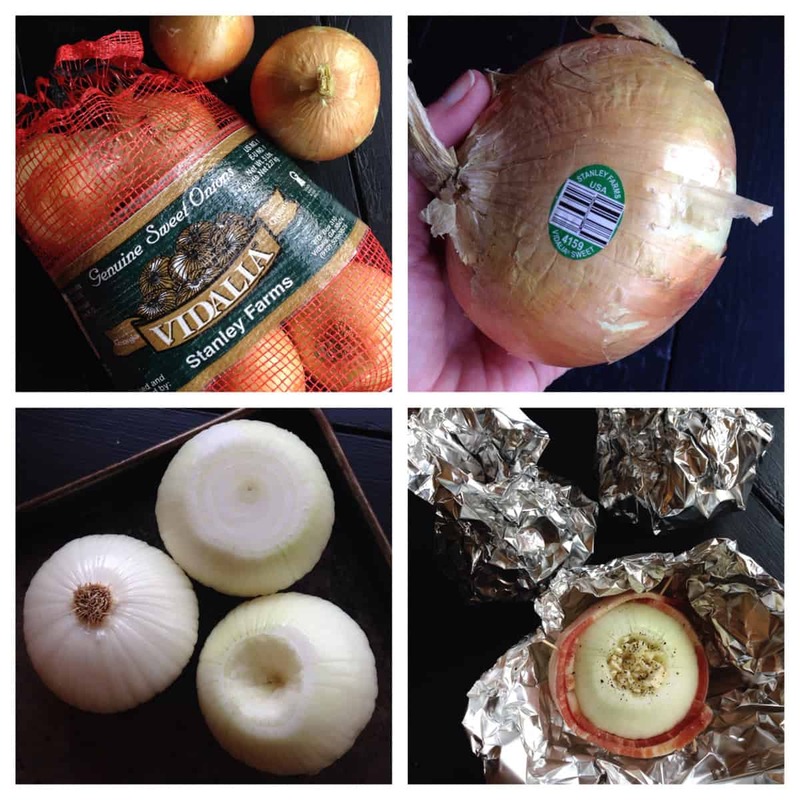 I’ve always loved a sweet Vidalia onion, and I pick some up whenever they’re available. But it wasn’t until I visited Georgia a couple weeks ago, as a guest of the Vidalia Onion Committee, that I fully realized why we get such a short seasonal supply of these sweet beauties. 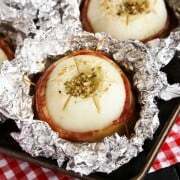 If you want to learn more about these amazing onions, grown only in Georgia, be sure to read on after the recipe. 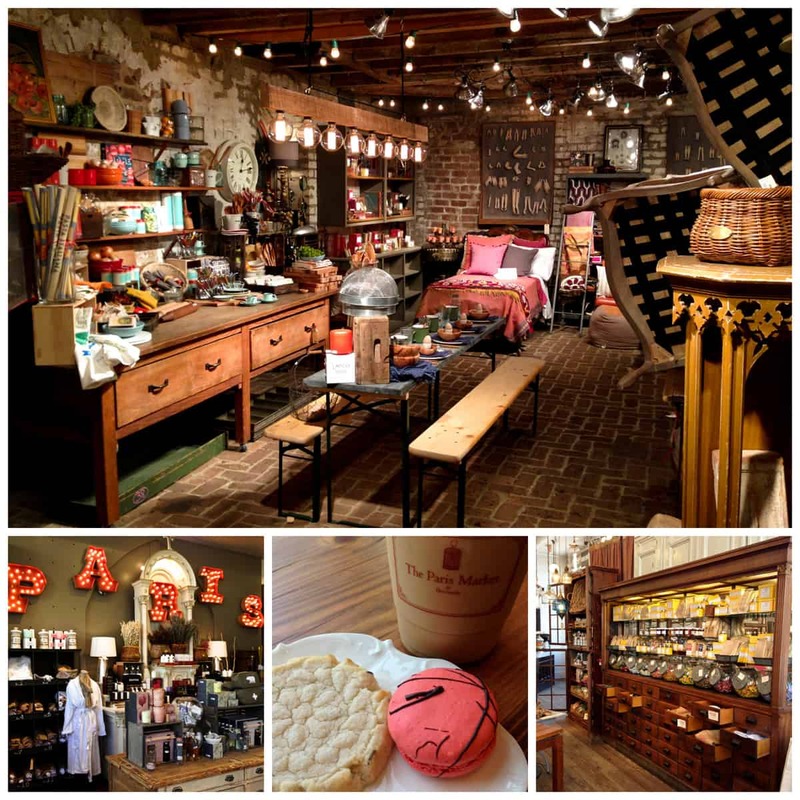 I’ll also show you a little bit of my time in Savannah and share an awesome giveaway with you (a $500 Williams-Sonoma gift card + Vidalia onions)! Whenever I travel, I look forward to coming back home and sharing an amazing recipe from my time away. So when Susan, the Executive Director of the Vidalia Onion Committee, shared that these onion and bacon packets were one of her family’s very favorite recipes for Vidalias, I knew I had to go home and try them for myself. 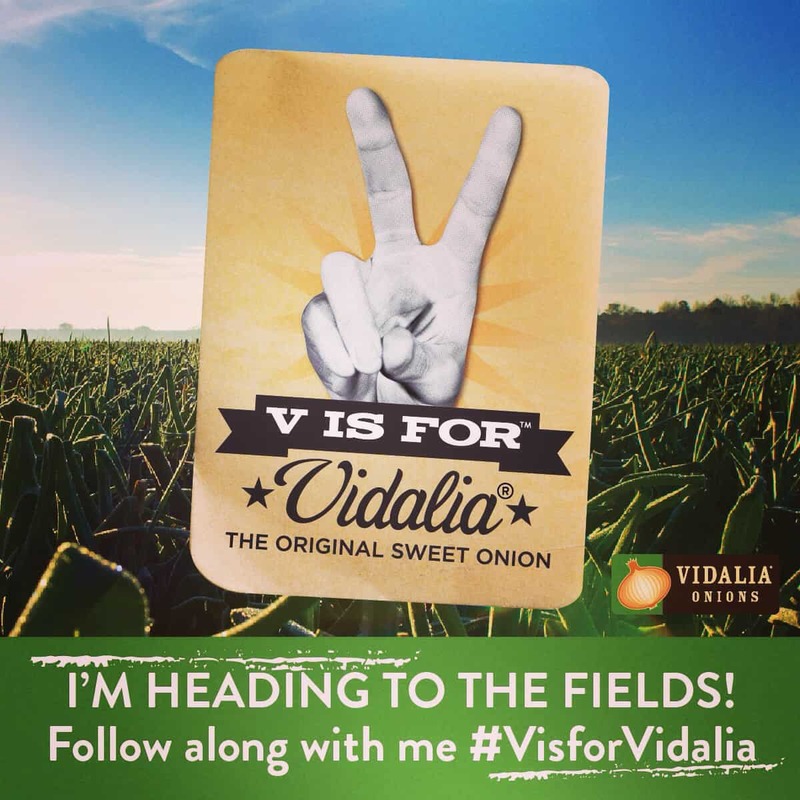 I baked up four humungous softball-size Vidalias for these Sweet Vidalia and Bacon Onion Packets. 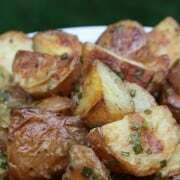 And, wow, are they the most perfect yummy side dish for a grilled steak. Delish! The key here is to use big beautiful Vidalias. Always look for #4159 on the product sticker. That means it’s officially a Vidalia from Georgia. Then peel it, clean up the root end and leave it intact, and slice off a thin piece of the top end. With a paring knife, core out a bit of the top. Then wrap a couple slices of bacon around it, fill the core with butter, fresh minced garlic, and a little beef bouillon. Bundle the whole thing up in some foil and voilà! You’ve got yourself some sweet little packets of bacon-y yum. Naturally mild and sweet, the Vidalias in these packets bake up tender and flavorful. The original recipe comes from Trisha Yearwood, which calls for cooking these on the grill. I baked mine in the oven. Plus, I added some fresh minced garlic and beef bouillon, as suggested by reader comments on Food Network. I wouldn’t change a thing. And I hope you enjoy this wonderful dish I brought back from Georgia, too! Peel the onions. Then clean up the root ends, leaving them intact. Slice off a thin piece of the top ends and then, with a paring knife, core out a bit from each of the tops. Wrap two slices of bacon around each onion’s middle, securing the bacon with 2 to 3 toothpicks. Then add a teaspoon of butter, one freshly minced garlic clove, and 1/4 teaspoon of the beef bouillon in each core. Season with salt and pepper. 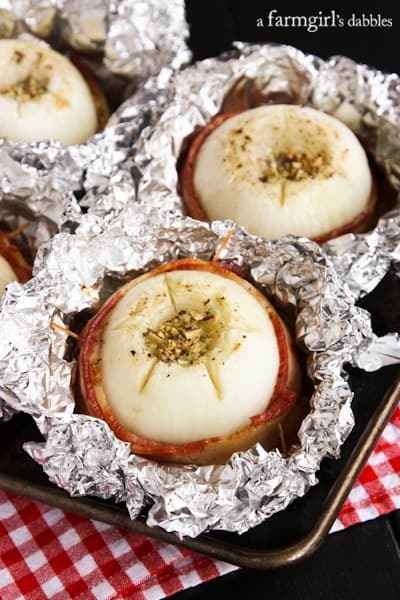 Place each onion on a square of heavy duty aluminum foil and bring the edges together at the top, taking care to not let the toothpicks poke through the foil. Leave a small opening at the top of the foil packet for steam to escape. 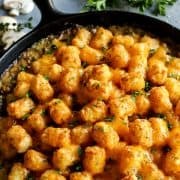 Place packets on a pan with sides and bake for at least one hour, until onion is tender when pierced with the tip of a knife, and the juices accumulated in the packets are bubbling a bit. The onions should be very fragrant and the garlic should be softened. 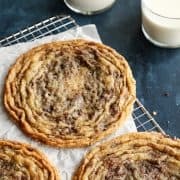 If you are using huge Vidalias, it may require baking for up to 30 to 45 minutes longer to achieve absolute tenderness. Adapted from Trisha Yearwood’s Uncle Wilson’s Grilled Onions. I hope you were following along with me (especially on Instagram!) as I visited Vidalia, Georgia. Always enamored with the south, this trip was really something special. 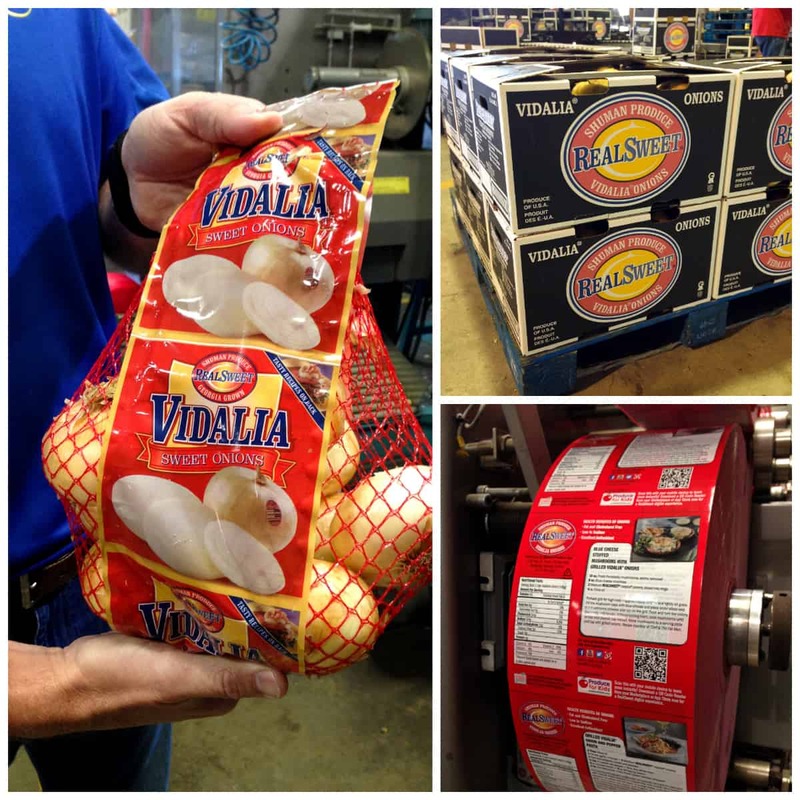 Those Vidalia onions were big and beautiful and sweet, and the southern hospitality completely followed suit. Everyone is just so great down there. Getting out in the fields and meeting the farmers who grow our nation’s fresh produce is always a treat. 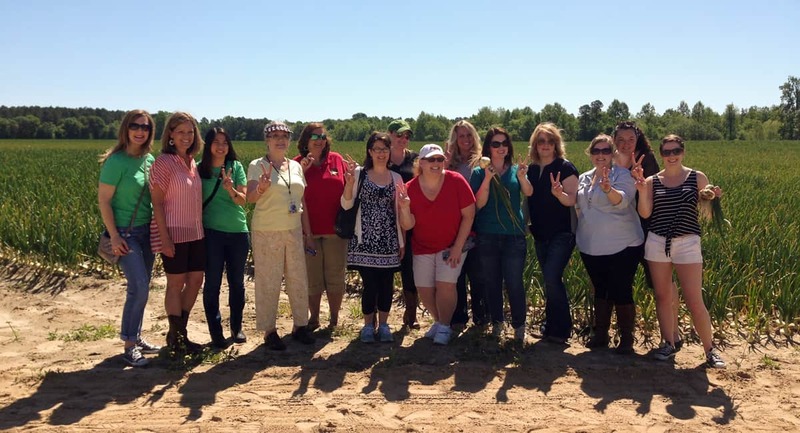 We were the guests of the McLain family, who started growing Vidalia onions in 1986. Their farm, which once grew tobacco, has been passed down through the generations. It was evident during the entire trip how much the state of Georgia prides itself in its Vidalias, but it was also great to see how much pride there is in the McLain’s family business. Vidalia’s admirable sweet and mild qualities can be attributed to this region’s soil makeup. It’s sandy, allowing for excellent drainage and disease control. And it has a low level of sulfur, giving the onions that sweet mild flavor that we all love. 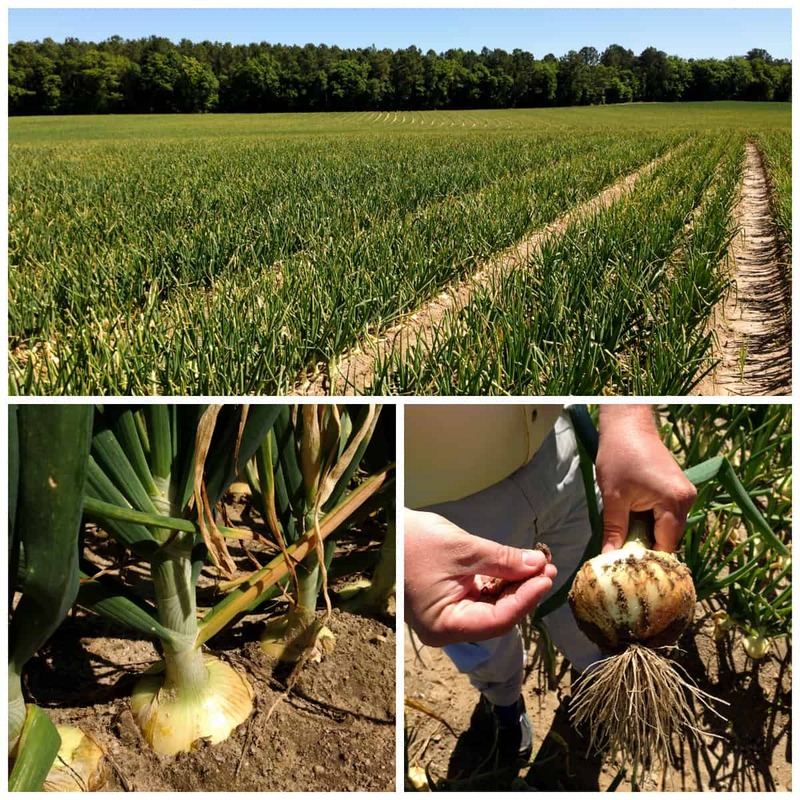 Vidalia onions are planted by hand, starting from seed (about 2 million seeds per acre!) each September. Once the seedlings are as thick as a pencil, they are transplanted manually, up to 100,000 plants per acre. And then they are hand harvested over a period of six weeks, starting in mid-April each year, providing us with sweet and juicy bulbs available through late August. Then the cycle starts all over again, with planting in September. 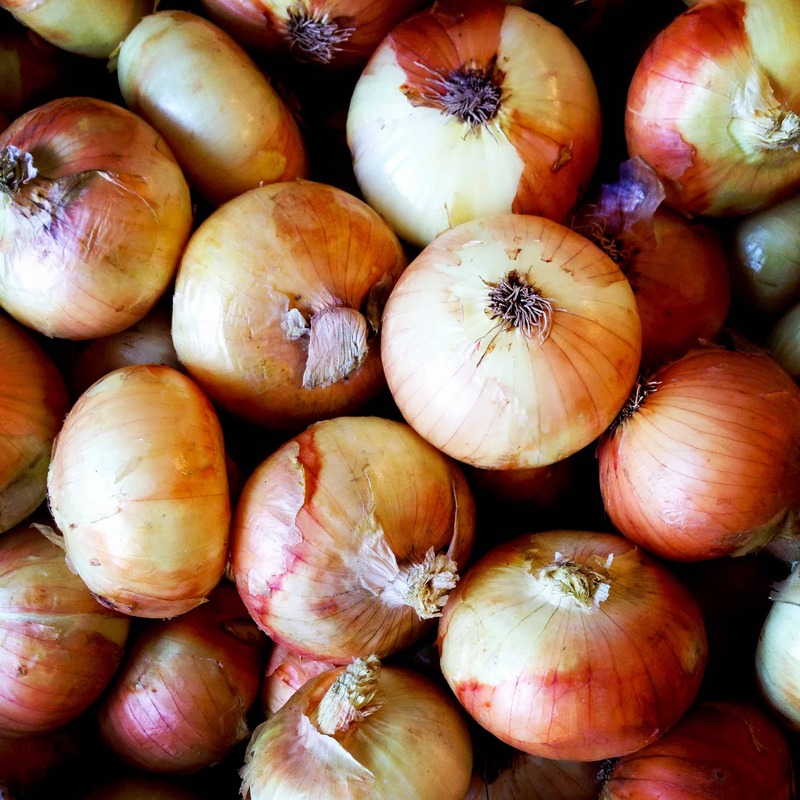 Like Susan (Executive Director of the Vidalia Onion Committee) said, “Even when you don’t see Vidalias for sale in the store, these farmers are still working year-round to provide us with their sweet onions”. The McLain’s business is built on family farm land. Their office is headquartered in the house where the current McLain managers’ grandparents once lived (photo: top). 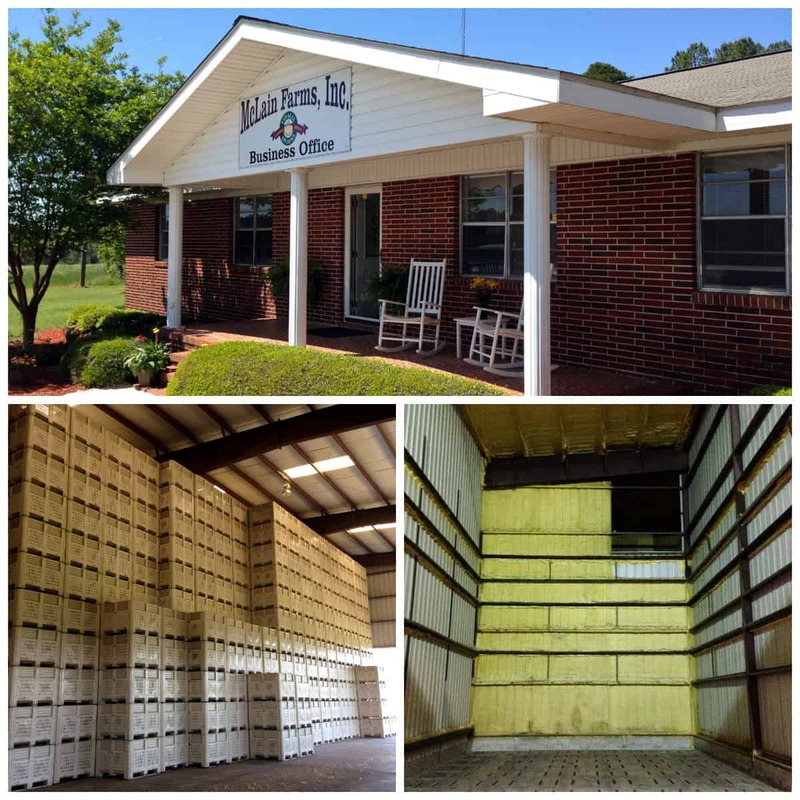 The McLains walked us through their process, from watching the Vidalias being harvested in the field to seeing how they are sorted, graded, and packed into crates for distribution (photo: lower left). During harvest, McLain Farms fills 20,000 of these crates, each holding 40 pounds of onions. The photo in the lower right shows one of their climate controlled storage areas, allowing the McLains to grow more onions for a longer term of distribution. Watching the onions being sorted by size and weight, into net bags that we see at the store, really brings the whole process full circle. We, as consumers, take so much for granted when we stop at the grocery store to “pick up a few things”. There is so much that goes on behind the scenes. Did you know that, by just looking at the label on these onions, the McLain family can tell you exactly what field these onions were harvested from, and the date they were harvested? It should come as no surprise that I consumed alot of onion dishes during my stay. Every single course of every single meal. Even dessert. Yes, that candied Vidalia onion cheesecake was awesome! And can you just imagine sweet Vidalias, just picked from the field, sliced up and fried for hot fresh onion rings (photo: top left)?! But onion rings weren’t enough. 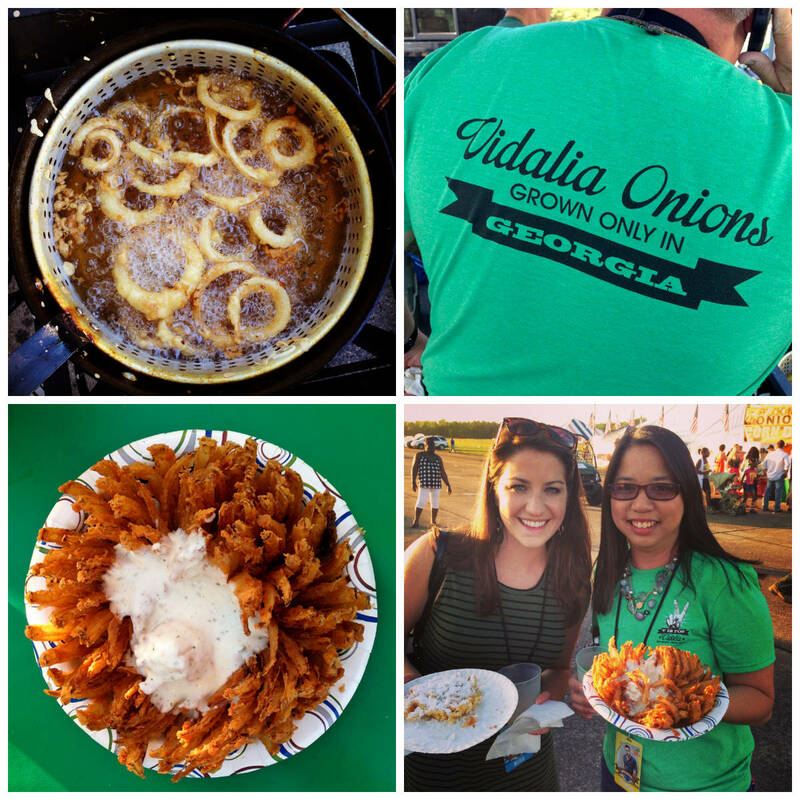 No…we couldn’t pass up a blooming onion that same evening at the 37th annual Vidalia Onion Festival (photo: bottom right, Julia and Julie), served up hot with some live country music. I would like to thank the Vidalia Onion Committee for inviting me to Vidalia. It was awesome to learn about your sweet onions. 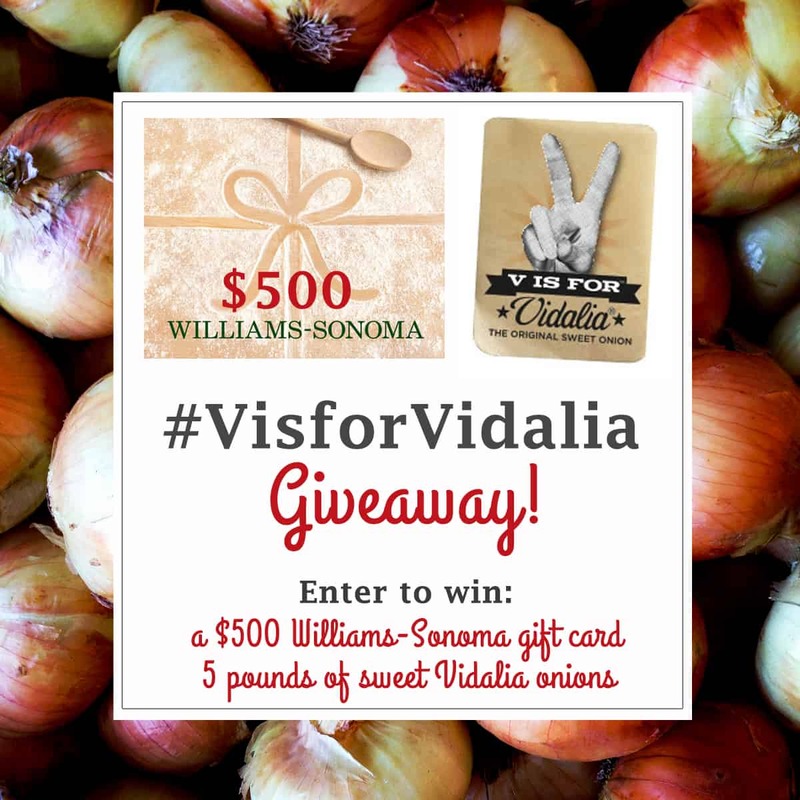 Here’s a giveaway you won’t want to miss, offered by the Vidalia Onion Committee. To enter, just hop over here! And to see a little bit of my time in Savannah, just keep reading! 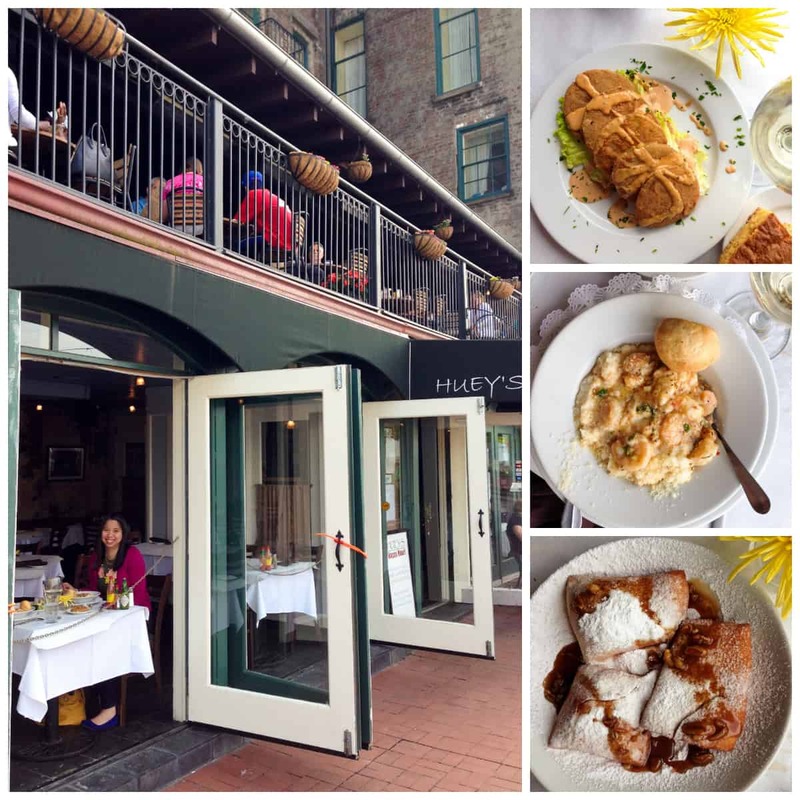 Julie and I met up in Savannah, one day prior to our time with the Vidalia Onion Committee, to see as much of the city and eat as much of its food as we could. 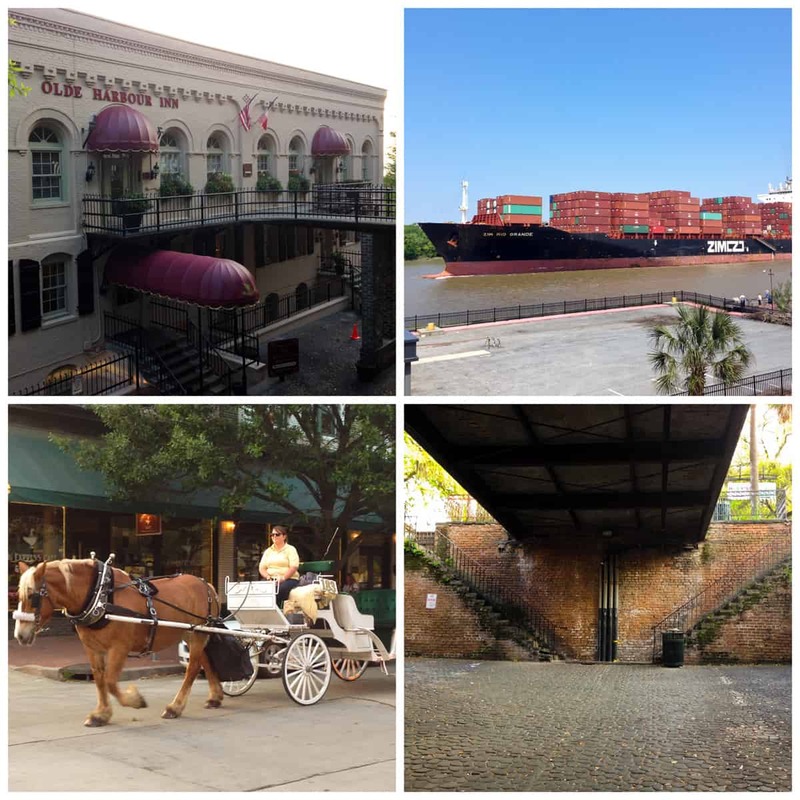 We stayed at the Olde Harbour Inn, situated in a lively area along the Savannah River, where we could watch large cargo ships pass by, right from our window. Horse drawn carriages were a common sighting as we meandered through the city, and I was amazed by all the different levels and stairways and cobblestone streets along the riverfront. It was at Huey’s, just a short walk from the Inn, where Julie and I shared a memorable alfresco meal along the river. I ate my first fried green tomatoes, so hot I kept burning my tongue with each bite. But I couldn’t stop! Then we split an order of shrimp and Parmesan grits…it was so awesome that I was tempted to reach across the table to grab the other half of the order away from Julie. Really. That good. And the fresh beignets with praline sauce was the perfect sweet ending. There were so many fun places to shop. 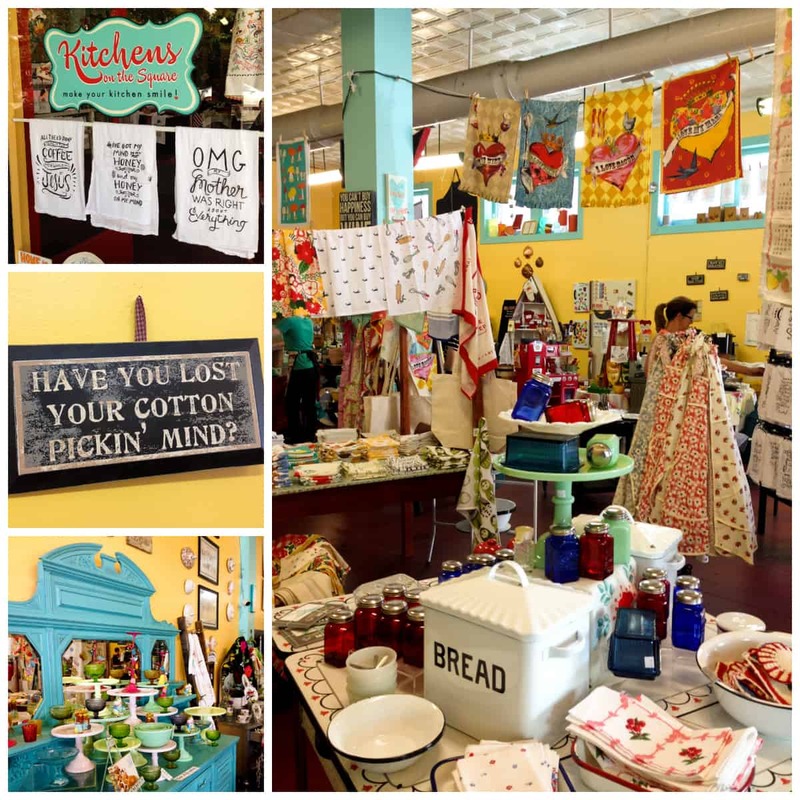 We spent quite alot of time at Kitchens on the Square, laughing at all the quirky sayings and wishing for so many of the beautiful and fun kitchen products and textiles set amongst all the antique props. I took a picture of the sign about losing your mind because it’s a phrase often heard from my dad. And The Paris Market. Ahhhhh… I could have spent all afternoon in this 2-story wonderland, sifting through the layers of fabulous items from all over the world. It was sophistication meets whimsy meets vintage and comfy worn flea market finds. And the little cafe is not to be missed, either, with its coffees and a small display case of delicious baked goods. The entire store was charming, to say the very least. 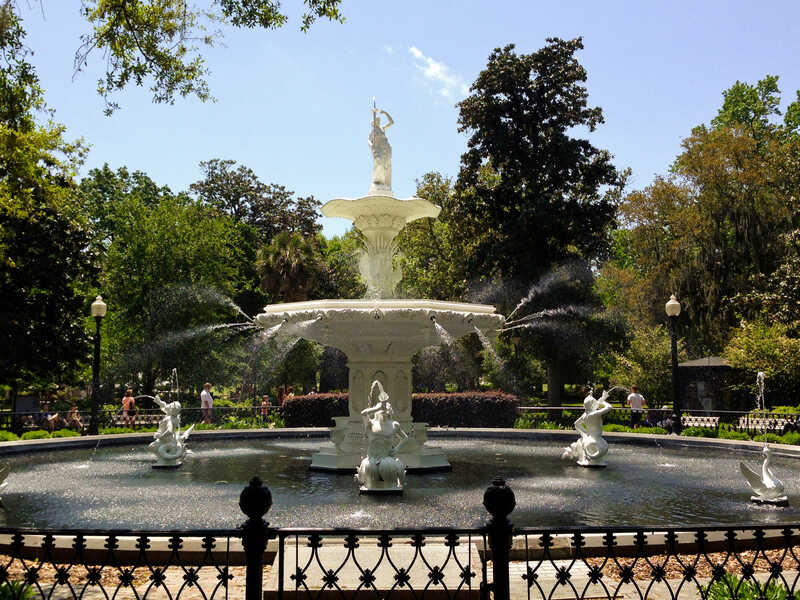 An icon of Savannah, it was so lovely to hear the water gently splashing at the famous Forsyth Park fountain. It sits proudly in a large city park in the Historic District of Savannah, surrounded by mammoth live oaks drooping with Spanish moss. On the other sides of the streets, north and south and east and west, are grand historic homes. How I wanted to walk through them and feel their history! Another favorite stop was the Savannah Bee Company, where you are able to taste test their whole line of honeys, including Tupelo Honey. Often referred to as “swamp honey”, this honey comes from the blossoms of the white tupelo tree that grows in swamplands in the southeastern United States. Because of its superb table quality, wonderful flavor, and resistance to granulation, it is highly prized by honey lovers. I happen to really like raw honey and fell head over heels for their Winter White Honey, too. It didn’t take long for my shopping basket to fill with honey products, both in edible and body care form. A few items for our family, plus gifts for Mother’s Day, Father’s Day, and a friend’s upcoming birthday…this stop completed a small gift giving shopping list absolutely perfectly. 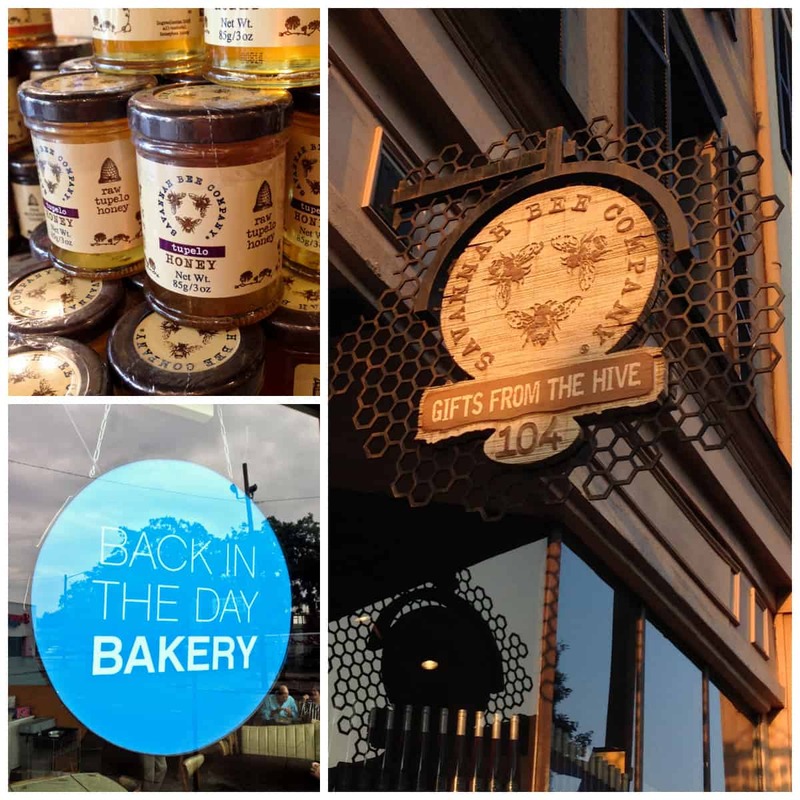 On our way out of Savannah, Julie and I stopped at Back in the Day Bakery, where we ran into Paula, Meredith, and Susan. 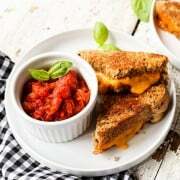 We shared a wonderful lunch comprised of handcrafted sandwiches and tender and tasty cupcakes, the from-scratch creations of husband and wife team Griffith and Cheryl Day (check out their cookbook!). Cheryl even came out and said hello, an awesome send-off for all of us as we headed west to Vidalia. Disclosure: Thank you to the Vidalia Onion Committee for this trip to Vidalia, and for providing the giveaway prize. I was not compensated to write this post. All opinions are my own. I am go in no to make the Tris ha Yearwood recipe.! Yum! This was a wonderful little side dish and was wonderful grilled. Savannah is one of my favorite places to visit! And as many times as I have been, there is always something new to see there. Thanks for the information! I’ve driven through Vidalia, Georgia a number of times, but next time I am going to stop. The recipe looks amazing and I can’t wait to give it a try. Out of this world amazing! I must have these! WHAT A experience!! I love that Paris Market! This looks so good! And gorgeous food travel photos and I loved reading all about it. This dish looks so good! Gorgeous food travel photos–and loved reading all about it. So enjoyed your post, Brenda. It was so fun to “see” your trip. And I picked up a bag of Vidalia onions today! I’ve seen the episode from Food Network where she has her uncle make this and it looked delious. 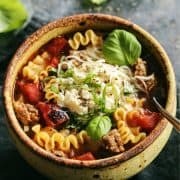 I’ve always wanted to try this recipe and the addition of garlic and beef bouillon screams more flavor! Can’t wait to try this. 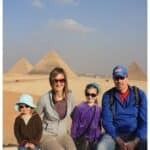 What great pictures from your visit! Fabulous! It was so good to see you in Vidalia! What a fun trip looks! Your recipe sounds yummy! Bacon makes everything better! This trip looks like it was a blast. 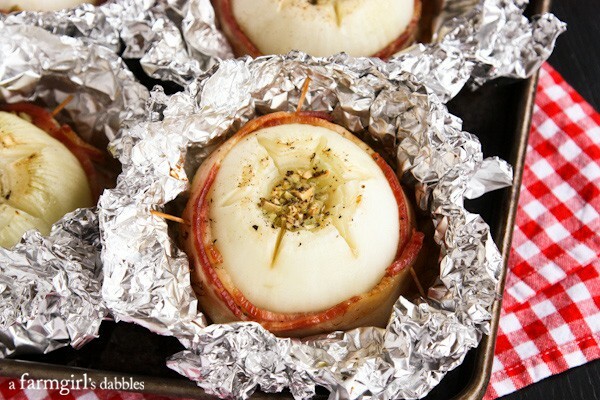 The bacon-wrapped onions look incredible, too! 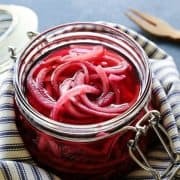 Absolutely awesome way to eat onions! I followed your trip on IG and was hungry the whole time! I’m a 100% onion fanatic! Wow, your trip looks amazing! 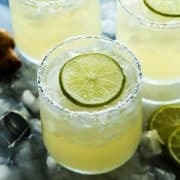 Very fun and this recipe sounds delicious!